Did you lose traffic rankings due to a recent search engine algorithm update? 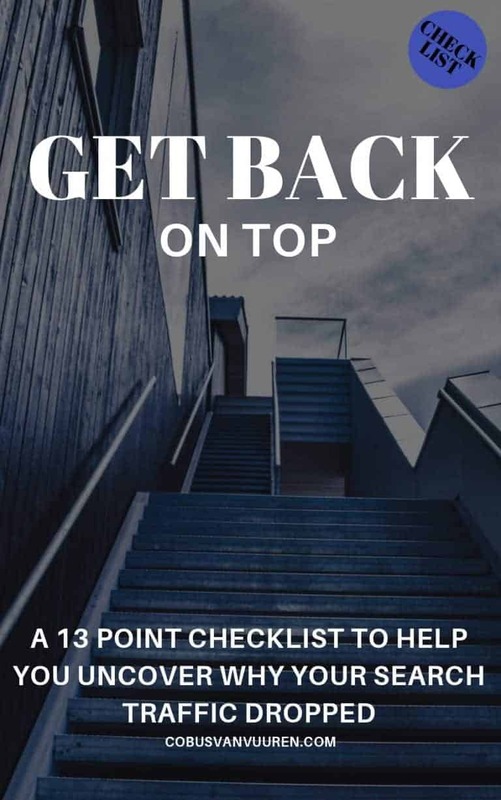 Download your 13 point checklist to help you discover exactly why your traffic dropped? Learn all you need to know of what happened to your search engine rankings. Based on reversed engineered results there are common factors that play a role you can learn from. Find the likely cause of what happened to your rankings so you can start the recovery. Thank you, Please check your inbox and confirm your email address. If you lost your traffic and rankings recently, you are not alone. How often does google update algorithm? It is reported that Google updates its ranking factors more than 500+ times per year. That’s is a lot of changes to keep track off and to keep on top off. Especially if they don’t really share why or what they update. It makes it difficult for a business to stay on top of all these changes. So what is the latest update from Google? Below I list some of the recent updates. If you lost traffic or rankings at the same time you might have suffered from the core update influencing your site. If your website has been negatively affected and you know you have the best result for that specific search query there are things you can do to recover your position. You can improve your on-site SEO, optimise your link profile. But it ultimately comes down to what Google wants to show as the most relevant useful information to its users. To attain good positions in the search results you need to have quality valuable relevant information that is informative, that provide a great user experience and builds trust and authority with your audience. How Google search engine algorithm works. The latest update ruined my rankings, what can I do? How to combat any google update? Can’t do infinite scroll after latest google update? What algorithm does Google use for search? I lost my main keywords, what now?